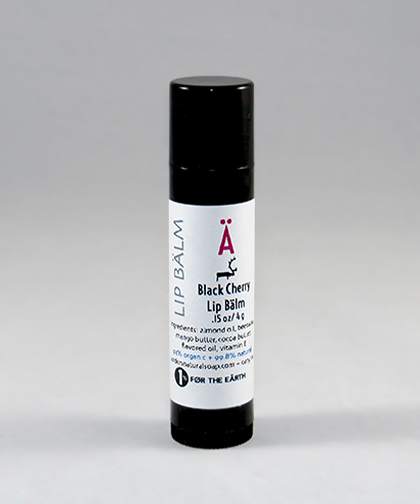 Our Black Cherry Lip Balm imparts that wonderful flavor and scent of succulent red cherries. We introduced our “Lip Balms” as one of our original products at the inception of our business back in the late 90&apos;s. All of our lip balms are 99.8% to 100% natural containing the following ingredients: almond oil, beeswax, mango butter, cocoa butter, a flavored oil or essential oil, and vitamin E. They are packaged in a (.15) oz tube with a label attached. We then shrink-wrap the tube for your protection. Mango butter has good emolliency and lends protection against the sun. It is said to prevent drying of the skin and formation of wrinkles. Mango butter also reduces degeneration of skin cells and restores elasticity. Mango butter&apos;s hardness makes it a great butter for stick formulations such as lip balm and lotion bars. It can be used to provide relief from the dryness of eczema and psoriasis. Cocoa Butter is a natural moisturizer that melts at room temperature which makes it ideal for your skin. Its health benefits come from its cocoa mass polyphenol. Cocoa butter, also called theobroma oil or theobroma cacao, is a pale-yellow, pure, edible vegetable fat extracted from the cocoa bean. Almond oil is acquired from dried almonds through a process called cold pressing. The good thing about using this skin care product is the benefits derived from its vitamins such as E, A and D. It is also rich in oleic and linoleic acids. It is mostly used as a skin care product but is also used as a medicinal oil for some skin disorders. Almonds have a way of trapping moisture in the skin keeping it moisturized at all times. Better still, its high lubricating quality makes many users stick to using it as their daily skin care product. Emollient properties refer to the ability of the almond oil to get absorbed into your skin. It is also used in many spas for its less fragrant and less greasy qualities. It is also useful in massages as it restores the normal PH of the skin and allows the skin to glow thus preserving moisture. Known mostly for its conditioning properties, beeswax also has a number of other benefits for the skin, including an anti-inflammatory action that helps to calm and soothe. When applied to the skin, beeswax forms a protective barrier that helps protect it from environmental assaults, while also holding in moisture and reducing dryness. This is one of the reasons beeswax is often used in lip balms. Unlike ingredients made from petroleum, however, beeswax doesn&apos;t “suffocate” the skin, and won&apos;t clog pores. Some ingredients “attract” water, and beeswax is one of them. When you put it on, you attract water molecules, helping to keep skin hydrated over time. Beeswax is an overall wonderful ingredient for lip balms. A natural oil that imparts that great flavor and scent of red cherries.